Open Daily. Entrance fee for divers 15 USD. There are no toilets, changing facilities or equipment tables. The parking lot is at the edge of the Cenote and entry to the water is via a steep set of metal stairs to a large wooden platform at the water’s edge. Dive gear must be lowered by rope and pulley. There are 2 Permanent Cavern lines one upstream and one downstream. Maximum depth is 7m/23ft. 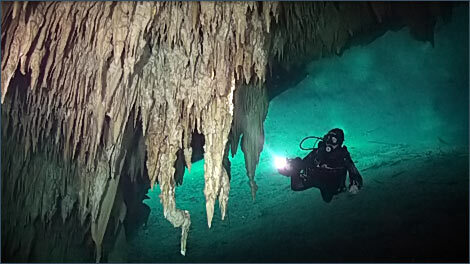 Dreamgate was the location for much of the underwater footage used in the filming for the BBC Planet Earth Documentary Series "Caves" episode as well as the BBC Natural World Documentary "Secrets of the Maya Underworld". Dreamgate is located 1km south of Dos Ojos on Highway 307. From the turnoff a very rough 4km dirt road leads out into the jungle. Dreamgate Cenote has 2 permanent Cavern lines one which leads upstream and one downstream both of which can be dived in either direction (clockwise or anticlockwise). The two Cavern dives are markedly different from one another. The Downstream Cavern Line is much longer than the upstream line, the dive is much darker and there are more silts and sediment present so good buoyancy control is very important. The permanent line loops around an air dome with a small solution chimney entrance through which one can enter or exit if required. The exit of the air dome is not always easy to see except on sunny days at a time when the sun is more or less overhead. In general the dive is quite dark and really gives the diver a taste of cave diving. Look out for the large tree root rafts shaped like trumpets floating at the surface in the air dome, you may also see some broken off lying on the bottom in places. You also have a good chance of seeing the ghost like albino, blind cave fish during this dive. The dive is very nicely decorated but not for those who are scared of the dark! Very demanding - silt on the bottom and formations all over require a very good buoyancy control. A metal ladder goes down to a wooden platform. The tanks have to be lowered by a rope. Only for experienced videographers. Just on request allowed.